Security for the opening of the National Museum of African-American History and Culture will be at very high levels, according to a document obtained by News4. The Joint Special Event Threat Assessment, prepared by the FBI and the Department of Homeland Security, said there are no current, credible threats surrounding Saturday's opening of the new museum. But the assessment referred to the sustained interest of terrorists and criminals in targeting mass gatherings or landmarks in the National Capital region. It specifically referenced concerns about white supremacist extremist groups, as well as international threats from groups, like Al-Qaeda and the Islamic State group. Kim Dine, former chief of the U.S. Capitol Police, has participated in many such high security events. 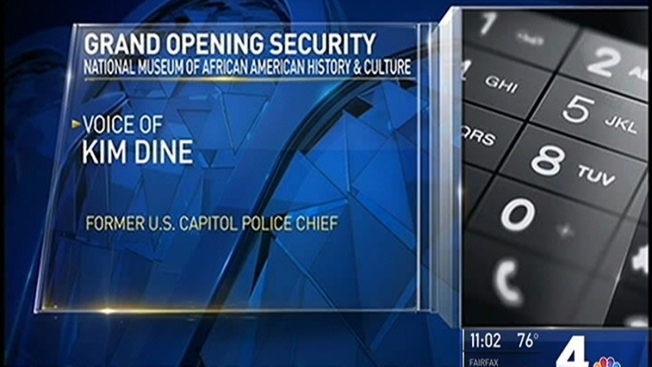 "Given the significance of this museum, significance in history, the fact that it is in downtown Washington, D.C., and the timing with all the other things going on nationally and internationally, it is of the utmost importance to all the law enforcement organizations to coordinate," Dine said. The actual physical security perimeter for the museum's opening was taking shape Tuesday night. Those lucky enough to have secured the timed entry tickets should be prepared for a considerable walk to get inside. Visitors can only gain entry through security screening at access points at 17th Street and Constitution Avenue NW or at 17th Street and Independence Avenue SW. Many streets in the area will be blocked off, but Metro stations will be open. Stay with News4 and NBCWashington.com for the latest information on events leading up to and including the opening weekend. Check out our special section for an inside preview look.